I can't even handle all of this cuteness. This is such a fun composition of these sweet sins. And now I really, really want a cupcake. That is really cute- and clever- I'd totally put that up in my kitchen. Love love love this! Way too cute! you are so right, that is way cute! Awesome! 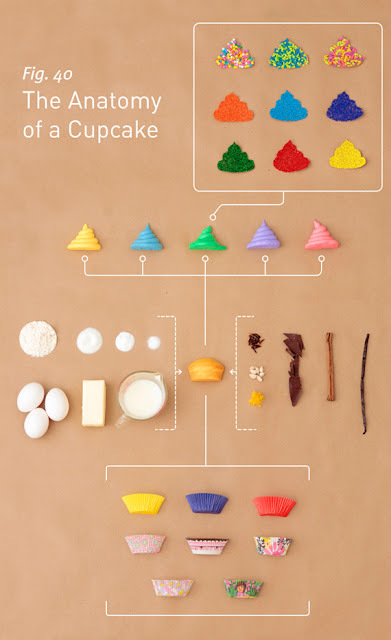 That's like a graphical menu for cupcakes. I love it! I can see this diagram making it onto a Threadless.com t-shirt! Best anatomy lesson ever! Love it!! I saw this poster the other day and thought the same thing. It would be amazing in a little girls room or in a married ladys' kitchen. whatever. I love food posters. There are a few I've been looking at late and think would be great framed in my kitchen. Too cute! Great blog - I'm a new follower! Thanks for visiting my blog and leaving a sweet comment. I'm glad you did so I could discover yours as well! I'm your newest follower. Nice blog. Mary, I have been off my blog-game lately, and haven't visited in awhile. But this was soooo cute! Now I must have a cupcake!! !